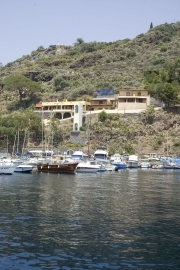 The hotel is located in Lipari, only 5 minutes away from the town centre. 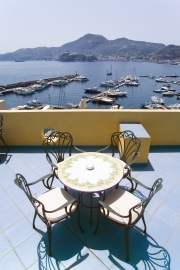 The Hotel A’ Pinnata is located above the yacht-harbour of Pignataro featuring a fantastic view over the east coast of Lipari. The house is tastefully furnished and provided with a big sun terrace and a cosy bar and breakfast room. Each of the 12 double rooms is called after the name of a sign of the zodiac. They have their private sun terrace, bathroom with hydro massage shower, air conditioning and heating , mini bar, satellite TV and Italian SKY TV, telephone, safe and internet connection. All the rooms have panoramic view and private terrace and are soundproofed.